To a parasite, the vertebrate body is a vast array of habitats waiting to be invaded. And like other animals, most helminths have adapted to a specific niche and are only found in one organ or even one tissue within an organ. 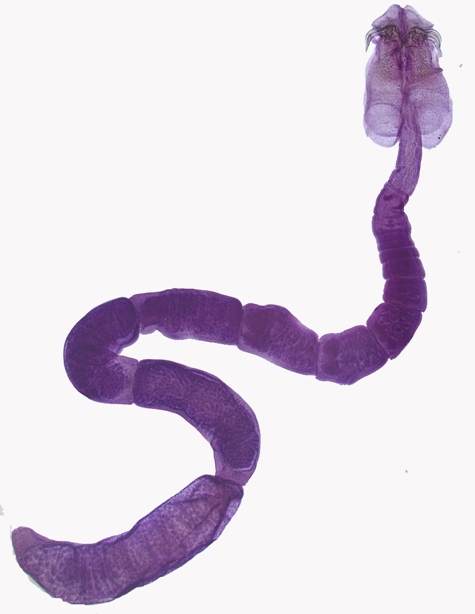 Nematodes of the genus Gongylonema live in sinuous tunnels in the wall of the anterior stomach and esophagus of birds and mammals and, when present in large numbers, can cause serious pathology. This spirurid genus is characterized by having wart-like growths on the cuticle of the anterior end. This species uses deer mice as its hosts. This pretty little African bird is commonly called the Cuckoo Finch or Parasitic Weaver and is a member of a family of African birds known as Viduidae, or the indigobirds or whydahs (now there's a good Scrabble word!). These birds are like cuckoos in that they lay their eggs in the nests of other birds and the hosts for Anomalospiza imberbis eggs are usually warblers. 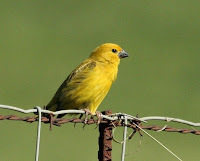 The females apparently remove any resident eggs before laying their own and then the little parasitic weavers convince their adoptive parents to feed them for several weeks before heading off to find a mate or join flocks of their own species. Haematopinus quadripertusus, commonly called the cattle tail louse, get its name because, well, because it lives on the tails of cattle. These lice will actually take their blood meals from both ends of the cow, however, and can also be found on the mouth and in the ears as well as some of the soft bits on the backside. 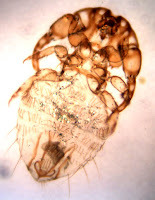 This louse was introduced into the Southern U.S. and is now a major pest of cattle in Florida, where they can cause anemia and weight loss - not something you want if you're trying to fatten up your cattle. Lice can spread from cow to cow when they are in close contact or via rubbing on the same thing such as a post. But, the lice can also colonize completely different herds of cattle by hitching rides on flies! 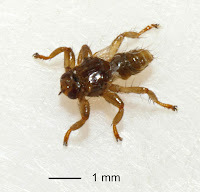 Image from this site, which has additional information on these parasites. 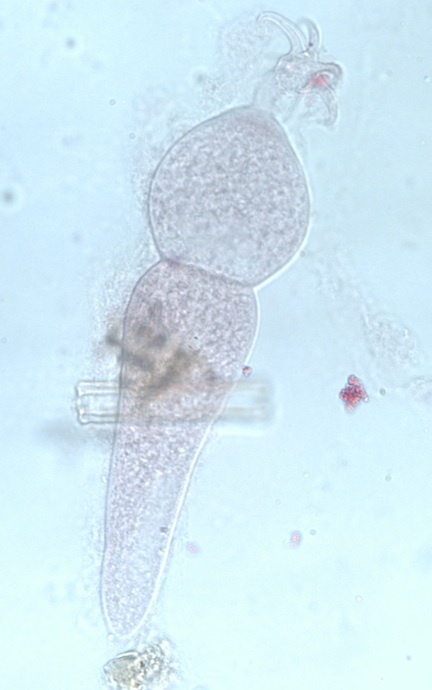 Today's parasite is a digenean trematode. And like most other digeneans, it multiplies asexually within its snail first intermediate host (in this case, a marine snail) producing larval stages call cercariae which are then released into the environment to infect the next host in the life-cycle. 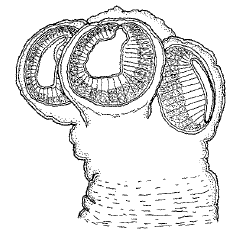 However, unlike most digeneans where individual cercaria swim off independently, each fending for itself, the cercariae of this species rally in the mantle cavity of the host snail where they hook the ends of their tails together before leaving via the snail's exhalant siphon as a collective. As they leave the snail, they synchronise their swimming motion so that the entire aggregate moves as one. To an unsuspecting fish, the writhing mass of cercariae resembles a struggling little zooplankton which would make for a tasty mouthful. Instead, as the fish swallows the wriggling ball of cercariae, the parasites get tangled up in the fish's mouth and begin penetrating into the host tissue. Imagine what a nightmarish experience that must be! It would be like you eating a handful of popcorn only to find in mid-chew that the popcorns are drilling their way into your throat! 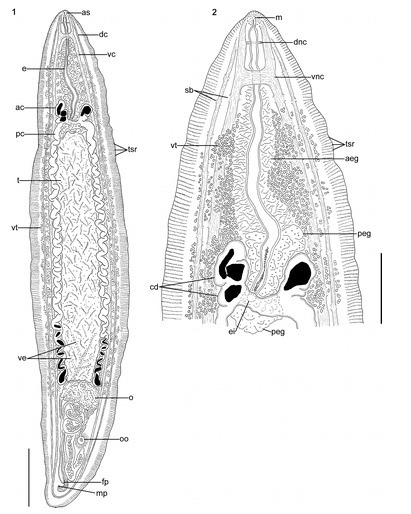 Beuret, J. and Pearson, J. C. (1994) Description of a new zygocercous cercaria (Opisthorchioidea: Heterophyidae) from prosobranch gastropods collected at Heron Island (Great Barrier Reef, Australia) and a review of zygocercariae. Systematic Parasitology 27:105-12. 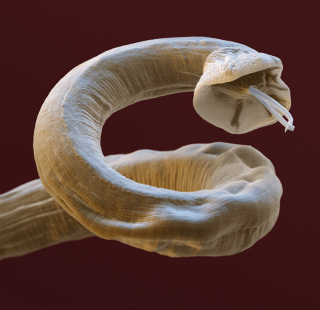 I have to admit that I included this parasite because I found this photo to be so striking. 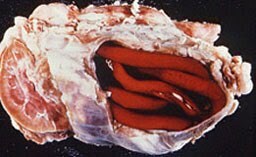 The image is of the sucker that the nematode, Aspidodera esperanzae, uses to attach itself to the intestine of its host. This species was discovered in armadillos in Paraguay in 1995 by a team of Japanese scientists who were part of a collaborative team sent to work on Chagas disease. The species is named after the consul of the Columbian embassy, however. Given my recent borderline obsession with these fries covered in cheese, bacon and scallions served at the restaruant downstairs from my office, this should have been one of the parasites featured in the week of parasites of plants I love (May 10-17). 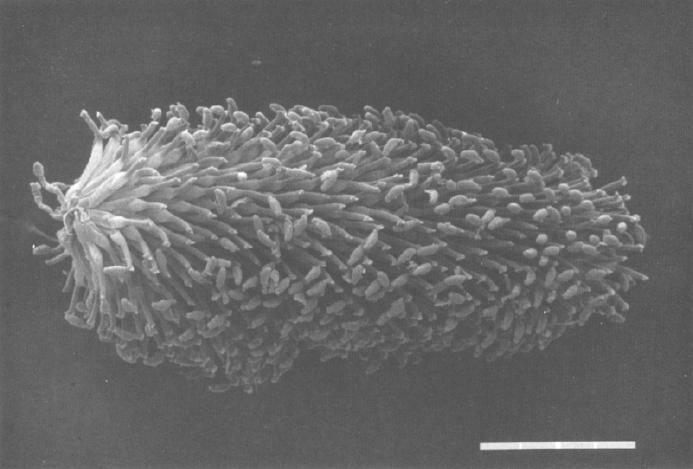 Spongospora subterranea is a parasite of potatoes that causes a disease with the funny name of "powdery scab." It used to be called a slime mold and grouped with fungi, but is now considered part of the phylum Cercozoa. 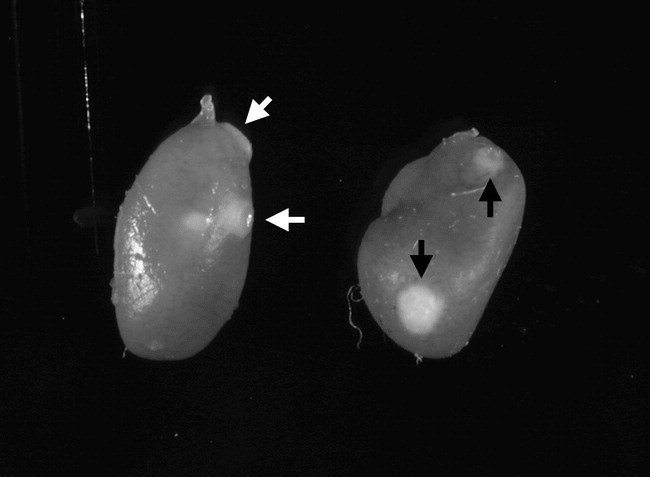 Free-swimming zoospores invade the roots of the potato and induce galls. There they produce the characteristic lesions that look a lot like scabs, which when they rupture and the spores are shed, look like, well, powdery scabs. Because the spores stay in the soil in enormous numbers, they can be really difficult to eliminate from a field. 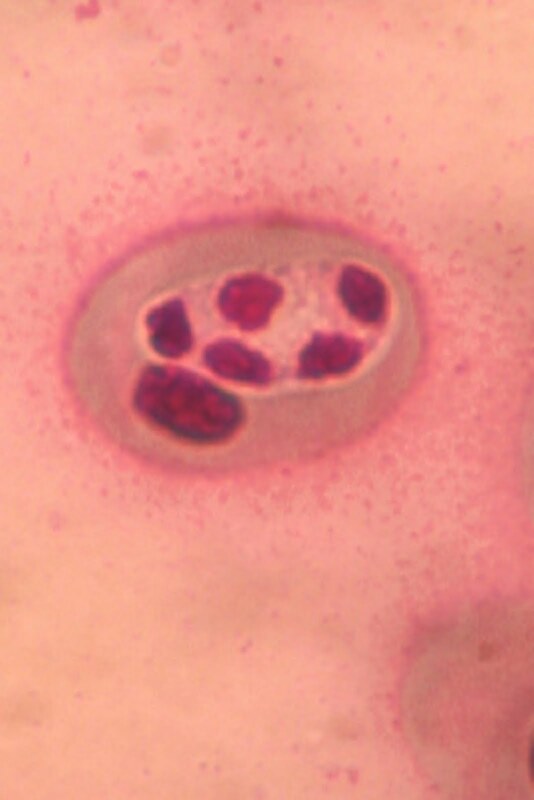 These parasites can be found throughout Europe, but some believe that they originally came from South America. 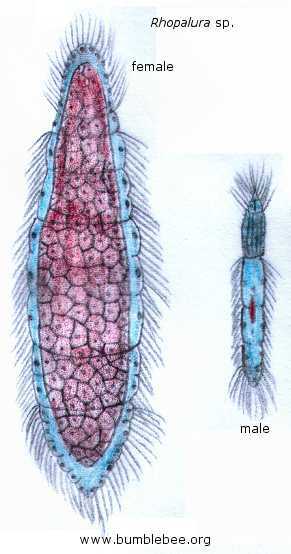 Spongospora subterranea is the vector for a virus as well. We'll meet that parasite soon. Photo is from this page. 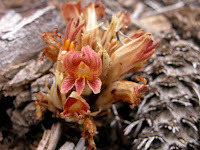 Some parasites are quite pretty - particularly parasitic plants, like Orobranche californica, California broomrape. These plants do not have leaves or chlorophyll and take their nutrients from their hosts, in this case, goldenrods and sagebrushes. This species grows all along the west coast of North America. It is currently divided into several subspecies based on habitat and host preferences. Here's another species of parasitic copepod, but this one's not going to fish eyes - just feeding off the skin, mucus, and blood of its hosts. 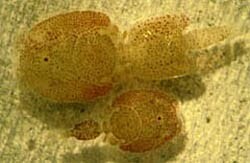 Lepeophtheirus salmonis is the salmon louse, which, as the name suggests, infects salmon and marine species of trout. These parasites can cause a great deal of morbidity in their fish hosts and may have severe consequences for both wild and farmed fish populations as very heavy infections of these parasites can kill the hosts. You can read more about these parasites on this site, which is also the source of the image. Meet Ribeiroia ondatrae, a nasty and evil (if you ask a tadpole) digenetic trematode. R. ondatrae has quite the complex life cycle requiring three different hosts. Briefly, R. ondatrae uses an aquatic snail as the first intermediate host, tadpoles as the second intermediate hosts and finally, an aquatic bird as the definitive host. R. ondatrae has gained world wide attention as a possible ecological driver behind amphibian declines due to the severe and grotesque limb/body malformations caused by infection, as the cercariae typically encyst as metacercariae within the developing hind limbs of a tadpole. Over the past decade or so, the consequences of this parasite for its tadpole intermediate host have been intensively investigated, especially in the context of additional stressors such as environmental contaminates. However, much more work is required in order to determine the specific mechanisms behind how this parasite actually messes up normal limb patterning and development. manage). Secondly the eye is considered to be a "immunologically benign environment" for parasites, thus such an attachment is less likely to illicit an immune response. While the parasite can cause significant damage to the cornea and result in blindness for the host, most sharks seem unaffected by the presence of the parasite and many sharks have the copepod in both eyes, strangely enough. This goes to show when considering the virulence (harmfulness of a parasite to its host) of a parasite, it is worth taking into account the perspective of the host involved - what may seem debilitating to us may not necessarily be the case for the actual organism in question. Also some good photos of live Greenland sharks with the parasite can be seen in Caloyianis, N. "Greenland Sharks." National Geographic 194, no. 3 (1998): 60–71. Pseudocorynosoma constrictum is an acanthocephalan parasite of North American waterfowl. 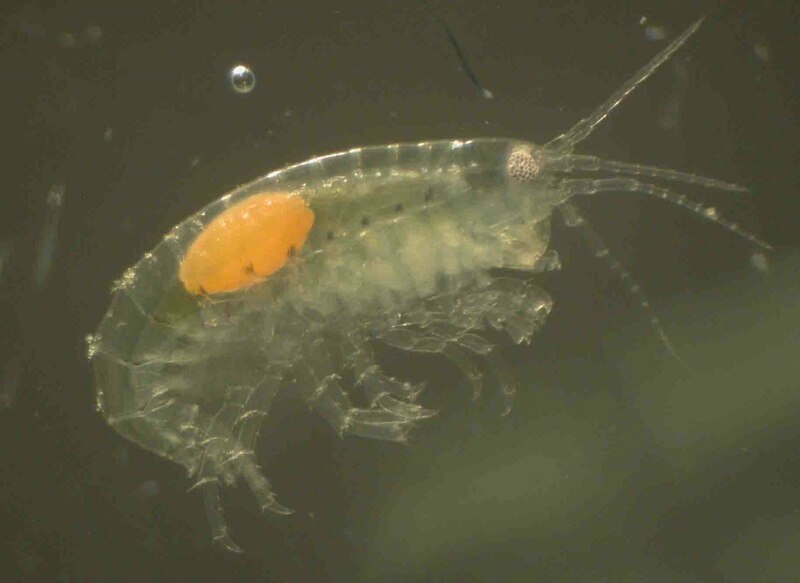 Eggs are released into lakes, where they are ingested by the first host, amphipods. 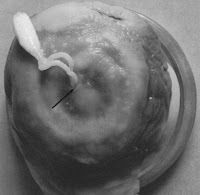 After about a month of development, the infective cystacanth stage is reached and the worm can be transmitted to birds. The cystacanths are bright orange and clearly visible through the cuticle of the intermediate host (see picture). Several acanthocephalan species have orange cystacanths, and there has been much debate about the function of this pigmentation. Hypotheses include increased conspicuousness to final host predators, protection against UV radiation, or that it is just a byproduct of larval physiology. Last week, you met Calliobothrium schneiderae, a tapeworm described by Maria Pickering, a graduate student in Janine Caira's lab at the University of Connecticut and also learned that Maria named that species after her high school biology teacher. 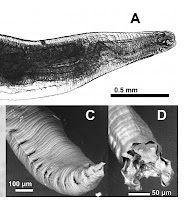 Today, meet another tapeworm of elasmobranchs (sharks and rays) that also came out of the Caira lab, and was described to science by Carrie Fyler. In 2008, Fyler had organized a symposium at the annual meeting of the American Society of Parasitologists in Arlington, Texas, that featured talks by three people on the topic of "Parasites and Popular Culture." One of the speakers in that symposium was Carl Zimmer, author of the book Parasite Rex as well as numerous other books, blogs, and articles. In gratitude, Carrie named a new species of tapeworm after him. Acanthobothirum zimmeri is a small tapeworm that infects a species of whip-ray off the coast of Australia, a host that itself is new to science. Zimmer seemed fairly pleased about this recognition when he blogged about it in The Loom, particularly that it had some bizarre features that helped make it a really great parasite. 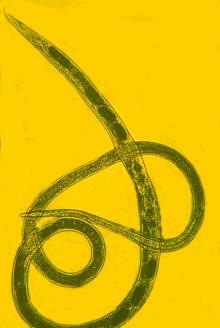 The number of species of tapeworms is enormous with more than 5,000 described species. But there are also close to 2000 undescribed species out there - so if you'd like to be so honored as well, your best bet is to do something to impress Janine Caira or one of her current or former students. If you're just joining us on "Parasite of the Day", you missed a rather interesting week (June 21-26) where we featured parasites that people eat - on purpose. Here's one more. Poor babies - baby horses, that is. Strongyloides westeri is a nematode known as a threadworm that can make foals very sick by giving them very bad diarrhea, resulting in weakness, weight loss and poor growth. The adult worms reside in the small intestine and lay eggs that pass out in the feces. Horses can be infected by ingesting the larvae or if the larvae penetrate through their skin, however, one of the most common routes of infection is via the mother's milk, which is somewhat unusual among parasites. For this reason, veterinarians commonly recommend that mares be dewormed on the day that they give birth and that foals be dewormed several times in their first few weeks. Lipoptena cervi is the deer ked or deer fly, a blood-feeding hippoboscid fly that is native to Europe and Asia, but has been introduced into the U.S. where it feeds on white-tailed deer and elk. Female flies only produce one larva at a time, but nurse it from milk glands within until it is ready to pupate. When the adult fly emerges, it seeks out a new host and takes up residence. It even goes so far as to lose its wings once it has its new mammalian permanent address. L. cervi is fairly specific to deer, but will occasionally bite dogs or humans - and it's said to be a painful bite when it does. Pocket gophers are fossorial rodents belonging to the family Geomyidae. These New World rodents build complicated underground burrow systems, producing multiple mounds of excavated soil at the surface, and often wreaking havoc to agricultural crops and pastures. Pocket gopher individuals live in small, isolated populations generally living solitary lifestyles, with one gopher occupying a burrow system. All pocket gophers have external fur-lined cheek pouches that they use to carry food (hence the name “pocket”). Another thing that pocket gophers have in common is that they are parasitized by chewing lice (Phthiraptera: Ischnocera). Chewing lice are wingless insects and obligate and permanent ectoparasites; they cannot survive for long periods of time off their hosts. 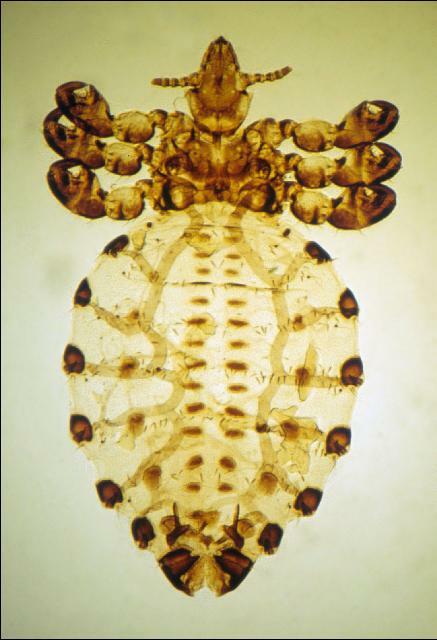 There are approximately 122 species and subspecies of these ectoparasitic chewing lice (belonging to the genera Geomydoecus and/or Thomomydoecus) and given the solitary lifestyle of their hosts in conjunction with their own limited dispersal abilities, gopher chewing lice are highly host specific. The close association between these wingless ectoparasites and their hosts has enabled the gopher-louse system to become a model system for studies of cospeciation. 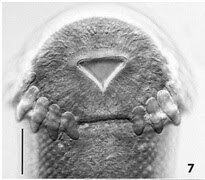 The pocket-gopher louse assemblage has been examined for almost 30 years using various types of data including distributional information, hosts associations, allozymes, and DNA sequences. Repeated statistical comparisons have shown that pocket gophers and their lice have been cospeciating over evolutionary time with lice often showing increased evolutionary rates. Current research includes additional examination of cospeciation at various taxonomic levels, and studies of parasite ecology, parasite transmission, and coadaptation enabling the gopher-louse assemblage to continues to be a model system in evolutionary biology. The species shown here is Geomydoecus coronadoi. Post and photo contributed by Jessica Light. "What? Didn’t know sharks have tapeworms? Well they do! In fact, most species of sharks have their own unique tapeworm fauna that live in their gut and absorb nutrients through their tegument (their outer layer, like our skin). Tapeworms attach to their host with their anterior end, called a scolex (shown here in this Scanning Electron Micrograph), which, in this case, is modified with muscular sucker-like bothridia and hooks. 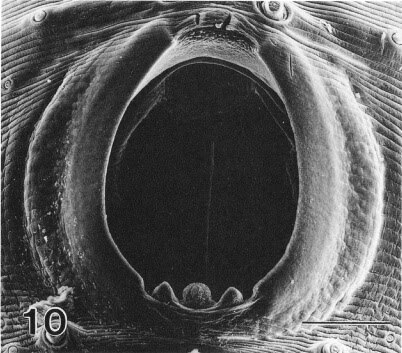 This one here, Calliobothrium schneiderae, parasitizes the intestine of the spotted estuary smooth-hound shark from New Zealand. It is pretty tiny; it doesn’t get much longer than 4 mm (that’s shorter than a grain of rice!). Tapeworms are found in all classes of vertebrates, and there are estimated to be 1000s of tapeworm species just waiting to be discovered and described! So next time you see a shark, don’t think about it eating you--think about all the cool creatures that are living in its gut, enjoying a meal of their own! " Angiostrongylus vasorum is commonly known as the "French heartworm", though unlike Dirofilaria immitis and D. ursis heartworms, this parasite is not a mosquito-borne filarial worm. Instead, this is a strongylid nematode, so like Strongyloides westeri. Both domestic and wild canids, especially foxes, are the vertebrate hosts for this parasite, but unlike the name suggests, the parasites are not purely confined to France, but are rather broad geographically. As you might guess, though, the adult worms reside in the host's heart. The eggs lodge themselves into lung capillaries and eventually the hatching larvae break through into the lung tissue where they get coughed up and swallowed, and passed out through the feces. Image is from this site. The aptly named Dioctophyma renale reaches maturity in the host’s kidneys. Also known as giant kidney worms, they are one of the largest nematodes capable of infecting humans-adult females grow to be over 100 cm long (they are also bright red and about 10 mm wide). Although they don’t feed on kidney tissue, they cause pressure necrosis (imagine a meter-long, centimeter wide worm living in your roughly computer mouse-sized kidney), turning the kidney into a non-functioning hollow shell. It has a cosmopolitan distribution and affects humans, several species of canids, horses and pigs, and uses annelids as intermediate hosts (fish can be paratenic hosts). Vertebrate hosts become infected by eating an infected intermediate or paratenic host or by drinking water in which they are swimming. Luckily, human infections are uncommon. On rare occasions, they become encysted in other organs (e.g. ovaries, uterus, urethra, mammary gland or subcutaneous tissue) or migrate through the digestive tract or abdominal cavity, making for an unpleasant finding during veterinary surgical procedures. Recently, the U.S. just traded some spies with Russia. Hopefully we didn't also trade parasites. Opisthorchis felineus is a liver fluke that primarily infects cats, as its name suggests, but it is also sometimes called the "Siberian Liver Fluke" because of its prevalence in Russia. It's a typical trematode with a complicated life cycle, which in this case involves snails, then fish and then finally fish-eating mammals such as cats or, sometimes, humans. The disease in humans can cause cirrhosis and liver cancer. Over a million Russians are infected and given the amount of vodka that gets drunk in Russia, that sounds like a pretty bad combination. Over on Dechronization, a blog I used to be involved with, Liam Revell posted a very cool video of an ant war going on in his yard. Alex Wild, who writes at Myrmecos, informed Liam and all that the ants were two colonies of pavement ants - Tetramorium - battling over territory. I thought that was pretty darn cool (and of course was just picturing tiny chitinous "Braveheart" scenes), but there's an added level of coolness. Anergates atratulus is a species of ant that is an obligate parasite on Tetramorium, in that A. atratulus does not produce its own workers. Entomologists have never found this species with a fertile Tetramorium queen, thus this parasitic species has to figure out a way to squeeze out its reproduction in a limited time span. July 10 -New gregarine sp. Dragonflies and damselfies are attractive creatures, yet they too have parasites! These include gregarines, which live in the intestine. Gregarines are single celled parasites known as apicomplexans, a group that also includes Plasmodium species, which cause malaria. Gregarines parasitize all sorts of invertebrates, such as oysters, beetles, earthworms, harvestmen, and a variety of insects. There are very likely tens of thousands, if not more, undiscovered species of gregarines in nature. For example, we recently found a new species of gregarine in the Eastern fork-tail damselfly in upstate New York, shown in this image. The star-like structure, the epimerite, is used to attach to the intestinal wall. We are now working on describing this new species. Post and photo contributed by Crystal Wiles and Florian Reyda. If you are thinking about swimming in a southern pond make sure you don't let your feet dangle...they might get chomped by an alligator snapping turtle (Macrochelys temminckii) - one of the meanest creatures you can come across. Maybe they are mean because they're often covered with leeches sucking their blood - and sometimes those leeches can transmit blood parasites, such as today's parasite, Haemogregarina macrochelysi, a new species of hemogregarine (another distant relative of malaria, Babesia and Toxoplasma). The authors of the paper reported that every single alligator snapping turtle they sampled from seven different locations had these parasites. Photo by Sam Telford, Jr., the primary author of the paper. Not only are we still discovering new species of parasites, sometimes we're finding whole new genera. Today's parasite is one such example. Nephroisospora eptesici is a new species of coccidian parasite that was recently found in the kidneys of big brown bats (Eptisecus fuscus) in Minnesota. 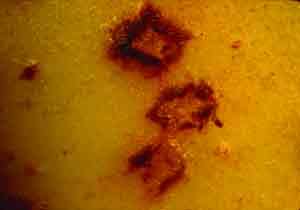 Bats that had been submitted for rabies testing were found to have macroscopic lesions on their kidneys (shown in photo) and subsequent analyses using histology of the lesions as well as DNA sequencing confirmed that they were coccidia. However, these parasites are very unusual in that they appear to undergo their entire life cycle in just one host - all of their relatives use two hosts. The discovery of sporocysts within the kidneys also was perplexing to the authors as other relatives (Isospora, Eimeria, Toxoplama) need oxygen to produce these stages. The original species description, where the photo is from can be found here. 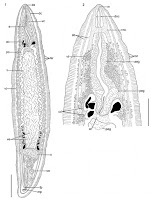 Anasakid nematodes in the genus Hysterothylacium are known to be quite diverse in fish worldwide, however just three species use North American freshwater fish as hosts and, until recently, none had ever been found infecting amphibians. H. burtti was recently found infected red-spotted newts (Notophthalmus viridescens) in Pennsylvania. The infected newts were found in ponds that did not contain any fish, thus it doesn't seem that they are just "spillover" or accidental hosts, but it is certainly possible that this species recently infected fish. Newts and fish such as sunfish consume many of the same prey items (which are intermediate hosts), so a host switch is certainly possible. The next in our week of "All American" parasites is Cardicola nonamo, a bloodfluke, which is a species of digenetic trematode that infects the hearts of two species of seaperches - the white seaperch and the (I love this name) rubberlip seaperch - off the coast of California. Despite the fact that this species was only described this year, the type specimens were collected back in 1936 and 1980. Ash Bullard, the scientist from Auburn University, who published the paper, named the species after a conglomeration of the names of the three people who had first collected it: Nobel; Nahhas; and Moser. Image comes from the original species description. Pristicola bruchi is a new species of trematode parasite that was recently discovered in lake sturgeon (Acipenser fulvescens) in Wisconsin. The intermediate hosts are not known yet, but based on related taxa and the food web in this ecosystem, oligochaetes are likely candidates. The discovery of this species now begins to shed light on the biogeography of sturgeon parasites. There are now three genera that each have two representative species - one in Eurasia and one in North America, suggesting a very ancient vicariant event, perhaps as old as the Cretaceous. Image is from the original species description, published in 2009. 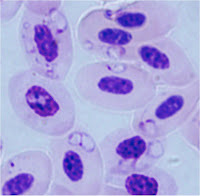 Recently, you met Babesia microti, an Apicomplexan parasite that is sometimes affectionately referred to as "Montauk malaria" because of it's presence in the Northeast and the fact that it causes a disease much like malaria in people who become infected via tick bites. Today's parasite is Babesia uriae, a species that infect birds - in this case, the murre, from California. Two birds were found to be infected after having been brought into wildlife rehabilitation centers. 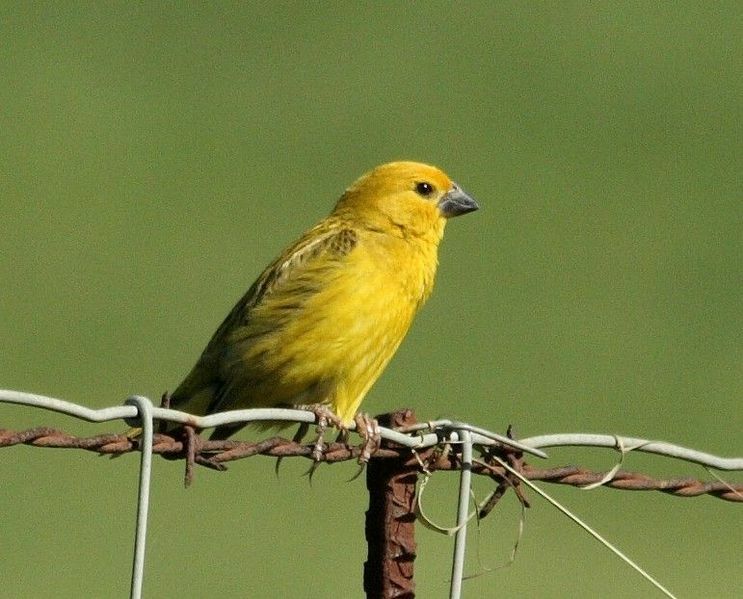 The parasites appear to cause pathology in these birds and based on both morphological differences and molecular data were determined to be a new species. This was the first time that a species of Babesia was found in the family Alcidae (the auks). Currently, the vectors are not known. Photo by Michael Yabsley, one of the discoverers of this species. 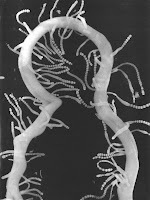 Raillietina cesticillus is a common tapeworm of chickens and other poultry. The intermediate hosts of this worm, beetles but sometimes even houseflies, eat the eggs of the tapeworm, where they develop into cysticercoids. The chicken then consumes the insects while it is foraging. Large numbers can infect a single bird, as shown in the photo. Argas persicus is a species of soft-bodied tick (Argasidae) that is common on chickens and other poultry. They like to hide in the wooden parts of the coops and then crawl onto the birds to feed. They can vector a species of bacteria called Borrelia anserina, which produces avian spirochetosis. Soft-bodied ticks aren't really so soft - they just are called that since they look rather shriveled until they fill themselves up with blood. 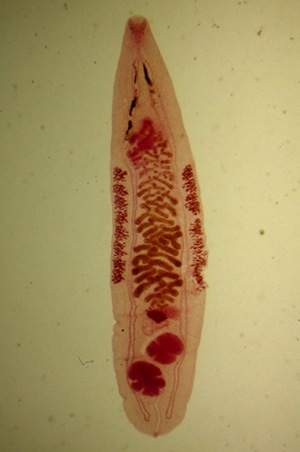 Rhopalura ophiocomae is a member of a very small, very obscure, and very enigmatic group of parasites that are part of a phylum called Orthonectida. They are multicellular organisms but lack both gastrointestinal tracts and nervous systems. This species infects brittlestars and will invade the gonads and castrate their hosts. The larvae are ciliated and invade new brittlestars via entering the genital clefts of those echinoderms. Inside this host, they essentially disintegrate to form an amoeboid structure called a plasmodium. A phylogenetic analysis based on the 18S genes of this species and several multicellular organisms and protists showed that these parasites were more closely related to triploblast organisms, but were not allied with anything else in the tree. Clearly someone needs to do some more work on this group!